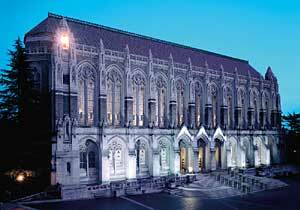 In college at UW I had a part time job in the library for about a year. Like many people I worked part time through most of college. I've heard it said that part time employment, ideally on campus, improves academic performance. This was certainly true in my case. Working at the library was an ideal job for me. The hours were flexible around classes, I could wander around interesting parts of the collection I would have never otherwise seen, and I could steal a nap on the 4th floor when on opening shift. I've reflected a lot on my college experience recently, as many people naturally do. 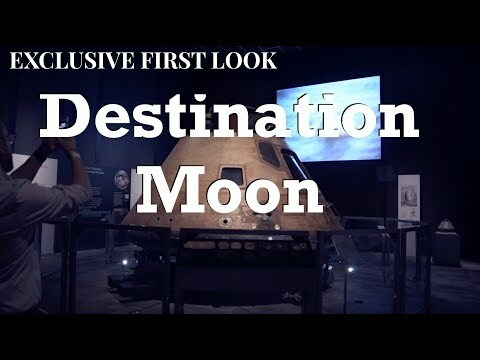 I met my wife then, I changed from pursuing an engineering career to academia and astronomy, I did a lot of growing up. (Incidentally, I didn't learn how to become a good student until I was enrolled in a Masters program) None of these changes in my life were expected when I left my rural high school for the big city. I didn't have a good idea of what University would really be about. I certainly never expected to become an advocate for libraries, nor becoming a member of a couple library advisory committees at UW in grad school. In high school and college I was an avid non-reader. "Books? I never touch the stuff." As I've grown to be part of the academic sphere, the critical role of libraries becomes more clear. And I even read books now, so it goes. This blog is nominally about science, data, and musing on the world around me. That means it's time for some library statistics! It just so happens that libraries, which are run by smart people, have been keeping statistics on their usage for a long time (e.g. see the Association of Research Libraries). 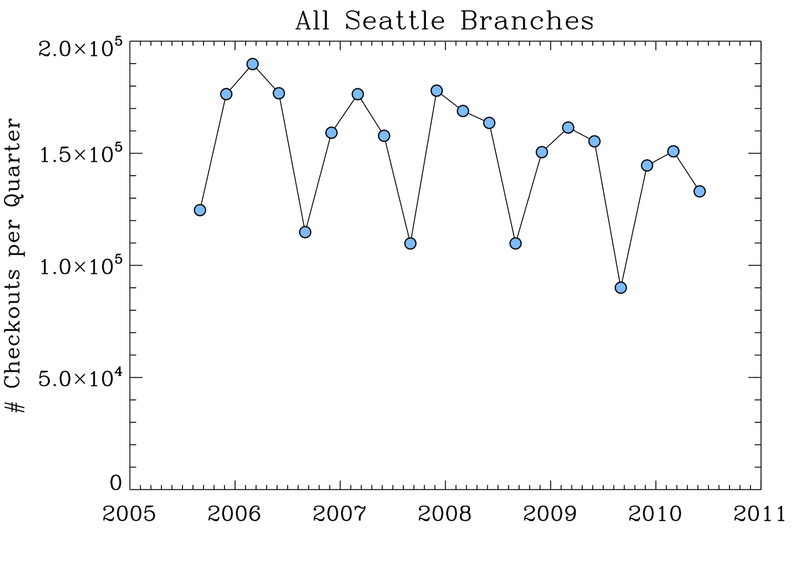 UW's libraries keep significant data, and I saw a great talk by Steve Hiller a few months ago on the subject. The data driven goal of this first library post will be to look at the usage trends of the UW library system, to gauge the importance of this major university facility. Fig 1. 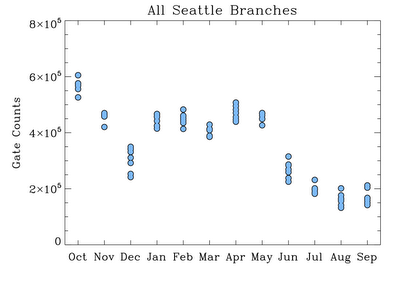 Average of autumn, winter, spring enrollment. 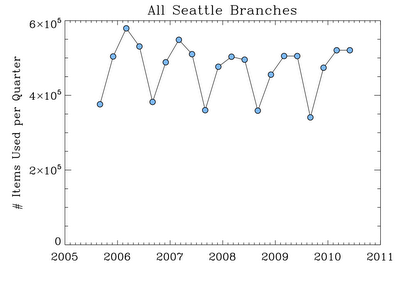 Data from the UW Factbook. 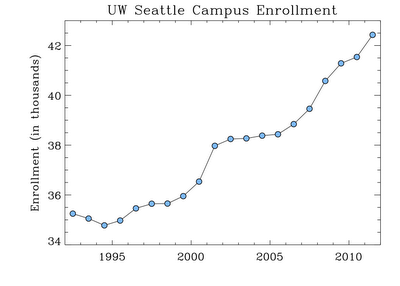 First, consider the enrollment trend at UW for the last two decades (above). 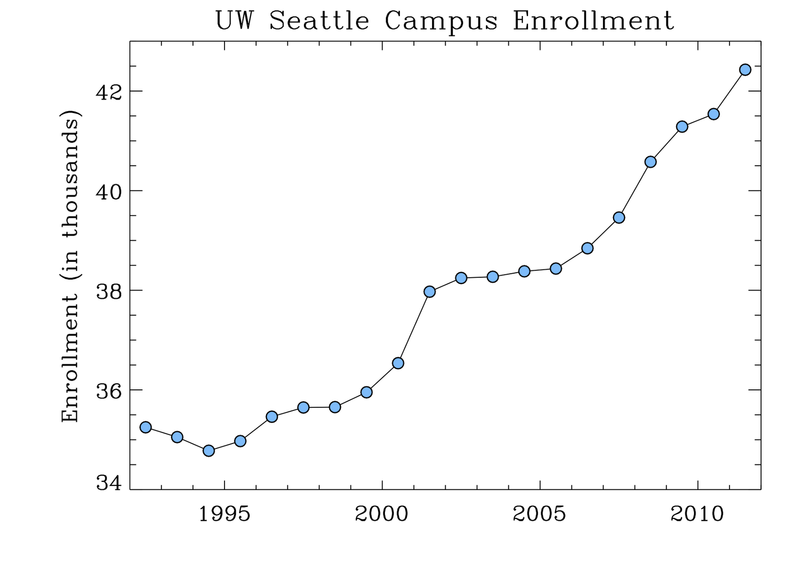 The UW campus has grown by ~25% since 1992. If we assume that the fraction of students checking out books stays the same, then the libraries should have received an increase in attendance. Fig 2. 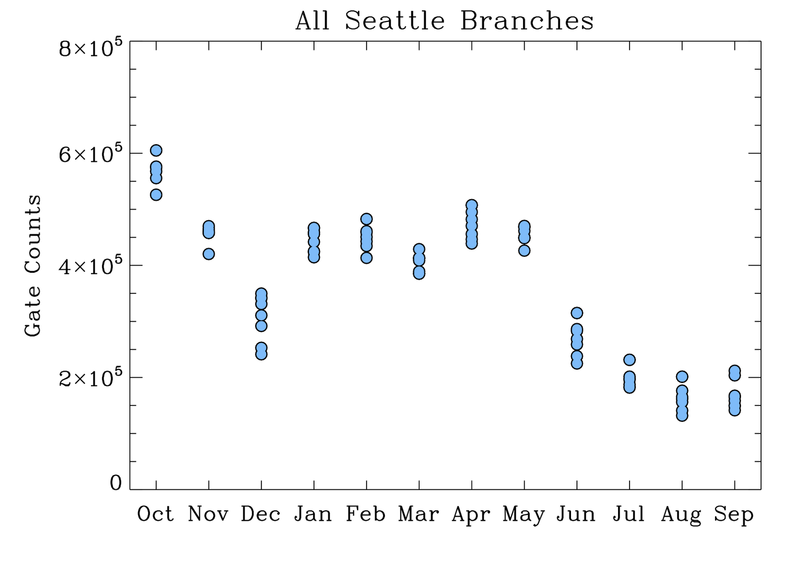 Monthly gate counts of patrons for all UW Seattle libraries as a function of time. 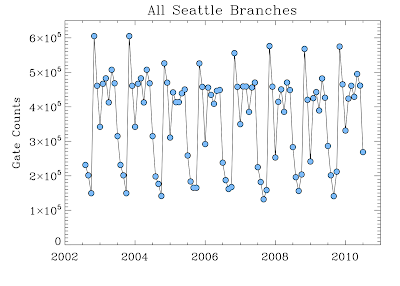 We can see in Figure 2, however, that over the last 10 years the monthly gate counts (warm bodies walking through the door) have been nearly constant. This monthly data has strong annual structure, which I'll highlight at the end. Since enrollment has been increasing, the fraction of people visiting the libraries is either decreasing, or the number of people who can visit the libraries has "saturated" (i.e. the library is at patron capacity). My intuition is the former. The flat trend in library patrons over time presents a clear message: people still go to the libraries. renewals, reserved, and re-shelved in-library items. In Figure 3 I'm showing the number of items used per quarter at all UW Seattle library branches. This includes items checked out, reserves, renewals of items already checked out, and books/items used in the library but not checked out. There is a slight decrease over the last 6 years in material usage, but the trend is slight. Fig 4. Number of checkouts per academic quarter. However, Figure 4 tells a somewhat different story. Just tracking the # of checked out items per quarter shows distinct decrease. This decline accounts for most of the net decrease in item usage seen in Figure 3. If you combine this decline with the rapidly increasing enrollment, one conclusion becomes clear: People aren't checking out books. Not at the rates of years past, at least. folded over the academic year. Finally we come back to the monthly gate counts of patrons walking through the library doors in Figure 5. As I mentioned above, the volume of patrons in the library has remained very steady. 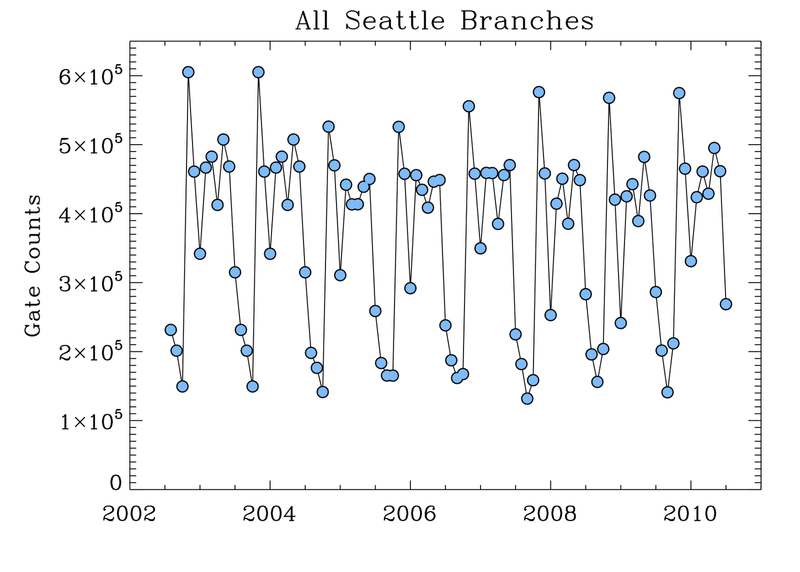 When we show these numbers as a function of month, placing each year on top of the other, an awesome and repeating pattern emerges (Fig 5). This subtly tells the story of how students use the libraries, how they continue to view them as critical to their academic success. In Autumn quarter, which typically starts around the last week of September, students flock to the libraries. The patronage that month is around 120% of the average! Year after year this is seen. Eager learners coming to the place they know will fill them with knowledge and inspiration. By the 2nd month of Autumn quarter they have "figured it out". Thanksgiving holiday sends students away, often for a week, but in general library use is strong. December numbers plummet. Winter holiday takes 2 weeks, and many students finish with classes in early Dec. The rest of the year reads off like a coarse academic calendar. Spring break in March. Graduation in June. Summer term in July/August. Library usage peaks when students are hopeful or have deadlines, and drops over holidays. 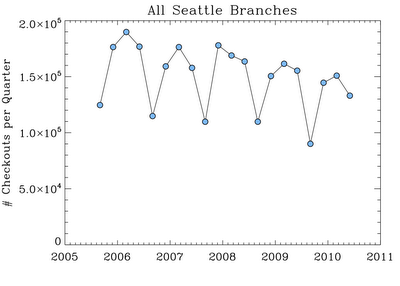 That's nearly all I have to say about these data (right now). To get a full sense of what the library is "good for" these days we'd need to see data on electronic usage and journal subscriptions/use, not included here and probably harder to quantify. I believe there is a clear message here: the library continues to be a hugely used resource on our campus, but the use of books decreases steadily. The library must therefore transition to becoming a more general hub for learning. From my meetings/conversations with admin in the library I can tell you that they know this, and are scrambling to redefine their scope. I mourn the loss of books in our every day lives. Small used book stores used to be found everywhere around UW, now I can only think of 1 within walking distance (Magus, and it is awesome). I sincerely hope, however, that the decline of paper book use does not come hand in hand with the decline in educational quality of our university... you're welcome to wildly speculate to that end.